In various industries, depth measurement is one of the most critical process parameter. Depth gauge is a type of pressure gauge used for measuring depths. 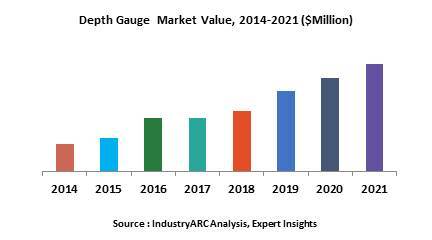 Globally, rising emphasis on industrial automation, growing need for optimum utilization of resources, and increasing need for treatment of water and wastewater are the prime growth drivers of global depth gauge market. In addition, increase in oil & gas industry, and metal and mining sector and, emerging economies such as China, India and others, will create new opportunities for global depth gauge market. However, downfall in petroleum prices, and lack of standardization are the key restraints for global depth gauge market. This report identifies the global depth gauge market size in for the year 2014-2016, and forecast of the same for year 2021. It also highlights the potential growth opportunities in the coming years, while also reviewing the market drivers, restraints, growth indicators, challenges, market dynamics, competitive landscape, and other key aspects with respect to global depth gauge market. Geographically North America dominated global depth gauge market, and Asia Pacific is projected to have fastest growth, owing to rapidly increasing metal & mining activities, rising water and wastewater treatment requirements, and boost in oil & gas exploration in this region. Among all the end-users, oil & gas segment has the highest market share in global depth gauge market. Chengdu Chengliang Tools Group Co., Ltd.
11.4. Chengdu Chengliang Tools Group Co., Ltd.
11.9. Aichi Tokei Denki Co.,ltd.